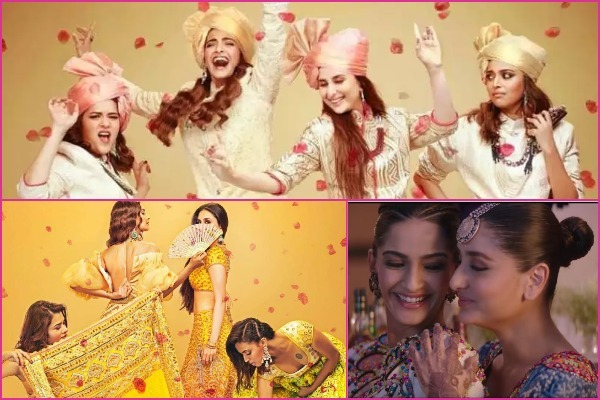 Sonam Kapoor, Kareena Kapoor & Swara Bhaskar starrer ‘Veere Di Wedding’ Trailer is out and we can’t keep calm! Ever since the title of Sonam Kapoor and Kareena Kapoor Khan-starrer film was zeroed in on, it became the talk of the town. ‘Veere Di Wedding’ has already created quite a lot of flutter on social networking websites and now that the posters and trailer are out, it has become clear that the quirky chick-flick has more to it than just chicks! The girl gang features Kareena Kapoor Khan, who has resumed work post her maternity break and we must say she’s looking gorgeous! Sonam Kapoor, Swara Bhaskar and newbie Shikha Talsania star alongside Mrs Khan, and the movie promises a lot of fun. A host of stars, including celebrity film critic Taran Adarsh and Anil Kapoor shared posters of ‘Veere Di Wedding’ on their Twitter accounts as they were released. Immediately after the official trailer launch of the film, directed by ‘Khoobsoorat’ helmer Shashanka Ghosh, hit video-sharing apps, people couldn’t keep calm. The unusual trailer of the movie, which also has “Permanent Roommates” star Sumeet Vyas, looks quite promising and offers a whole new perspective on chick-flicks. By the first look of it, the unlikely female-oriented film seems to be a total entertainer. The movie looks like a roller coaster ride, with F-words dropped like bombs here and there. It has oodles of enjoyable moments and the sneak peek offers a look into the lives of four girlfriends, who’re dealing with their own problems. Lead stars Kareena Kapoor Khan and Sonam Kapoor made a grand entry at the trailer launch of the buddy comedy movie and the ladies set the temperatures soaring the moment they stepped in their designer dresses. Filmmaker Karan Johar was quite impressed with the first look and took to his Twitter account to share his thoughts. Looks like ‘Veere Di Wedding’ will be one enjoyable chick-flick (which doesn’t call itself a chick-flick – #imnotaCHICKflick) and give a new meaning to friendship and relationships. The film releases on June 1. Previous : Watch: Official Teaser of Sanjay Dutt’s Biopic ‘Sanju’; Ranbir Kapoor Nails All Eight Looks!